Welcome to Proteome Factory AG! Your specialist in contract research, fee-for-service and products for proteomics, biomarker & target discovery and validation, protein identification and characterization with more than 15 years experience in modern protein analysis and proteomics. Please take a look at our new website at www.proteome-factory.com. A brief overview of Proteome Factory's portfolio is available as a PDF document for downloading. Stay here | Take me to the new site. We offer fully supported contract research, fee-for-services and advanced products for gel-based and gel-free proteome analysis (proteomics), protein identification, protein & peptide sequencing, characterization, analysis and epitope mapping by MS. State-of-the-art technologies and methods are routinely employed for differential proteomics studies and quantification and validation of regulated proteins, biomarkers and targets. Beside extreme high resolution 2D electrophoresis allowing the separation of theoretically up to 10000 thousand protein spots in 40 x 30 cm 2DE gels we apply gel-free methodes like iTRAQ™* proteomics, label-free nanoHPLC-ESI-MSMS based proteomics and MeCAT proteomics. The later is very useful for pharmacokinetics of protein drugs allowing ultrasensitive absolute quantification of intact MeCAT lanthanide labelled proteins down to low attomol range of protein by ICP-MS. Furthermore protein phosphorylation and naturally occurring metalloproteins can be analyzed by quantification of phosphorus or other elements using ICP-MS in parallel. In addition we employ quantitative mass spectrometry of proteins and peptides by selected reaction monitoring (SRM) or multiple reaction monitoring (MRM) assays (mass western) for biomarker validation and quantification of protein expression, protein drug concentration in plasma and absolute quantification of proteins and their isoforms. In plasma proteomics and CSF proteomics we deplete high abundance proteins by affinity removal before applying 2DE or gel-free proteomics methods. Standard and high resolution mass spectrometry is employed for epitope mapping of antibodies and identification, quantification and characterization of proteins and peptides including determination of phosphorylation and glycosylation sites and optionally their structure. Proteins and peptides are identified with conventional database search engines or by de novo peptide sequencing. Beside proteomics studies Proteome Factory is specialized in providing full services for complete protein sequencing and characterization using a combination of N-terminal and internal Edman protein sequencing, HPLC, MSMS mass spectrometry and de novo peptide sequencing. Proteome Factory is proud to have worldwide customers and partners including leading pharmaceutical, food and biotech companies as well as many well-known academic institutions like the Max-Planck and Riken institutes. MeCAT proteomics and protein quantification MeCAT - Metal Coded Tagging - Technology for quantitative proteomics and ultrasensivite absolute protein quantification down to attomol. MeCAT is the next generation proteomics and protein quantification technology which allows first time absolute and ultra sensitive quantification of proteins and peptides at low attomol range by multiplex experiments using ICP mass spectrometry for quantification. Further technological improvements will probably increase the sensitive down to zeptomol range. 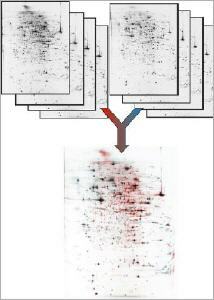 MeCAT is compatible to known techniques and methods for protein and proteome analysis like high resolution 2DE, SDS-PAGE and chromatography. Analysis by MALDI-MS and ESI-MSMS can be used for protein identification and relative quantification on peptide level in analogy to stable isotopic labelling methods. Proteome Factory�s HTS spot picking robot spotXpress is used for automatic protein gel spot picking from 2D electrophoresis gels. Its new patented spot picking technology enables high throughput spot picking of up to 800 spot per hour- Please, contact us for a quote! The breakable SDS-PAGE kit DPAGE contains solutions to prepare special SDS-PAGE gels for SDS-PAGE and 2D electrophoresis which can be dissolved after protein separation and staining of the gels. Thus protein spots or gel bands of interest can be cut and easily dissolved to perform further analysis of these protein bands in solution. For example absolute quantification of MeCAT labelled proteins can be easily and fast performed by flow-injection ICP-MS analysis of dissolved 2DE protein gel spots. This silver staining kit is truly compatible with mass spectrometric analysis of protein spots and bands. It is about 20-100 times more sensitive than common Coomassie Blue staining methods and enables a better protein identification of protein spots than other silver staining products. Its protein detection limit is about 1 ng/mm2 with very low staining background. FireRuth is a ready-to-use fluorescent staining solution for 2DE and SDS-PAGE gels with a linear dynamic detection range from low nanogram to microgram. FireRuth fluorescent staining is compatible to common mass spectrometric protein identification methods. The Proteome Factory is your service provider for protein identification and mass spec analysis of proteins and peptides using state-of-the-art technologies and methods. Nano-LC online coupled to nanoESI-MSMS is used as standard method for reliable and high sensitive protein identification and characterization of single proteins or protein mixtures. nanoLC-ESI-MSMS is highly useful for analysis of protein spots from 2DE, protein bands from SDS-PAGE and low to middle complex protein mixtures. The Proteome Factory offers N-terminal protein and peptide Edman sequencing beside protein identification by mass spectrometry. N-terminal sequencing is performed by using a Procise 491 Micro Proteinsequencer. Peptides and Proteins which can be in solution, lyophilzed or blotted on PVDF membrane are analyzed. The standard Edman sequencing package includes set-up and 5 N-terminal sequencing step which can be extended to about 40 steps depending on customer�s demand and sample quantity. The Proteome Factory is specialized in differential proteomics (proteome analysis) offering gel-based and gel-free proteomics approaches beside standard protein identification and sequencing services for many years. Proteomics is offered as comprehensive contract research services or pilot study services. Proteome Factory�s differential proteomics portfolio covers top-down approaches like extreme high resolution 2DE which enables protein quantification of several thousand protein spots including analysis of protein species e.g. caused by post-translational modifications. By MeCAT labelling multiplex analyses can be performed with absolute quantification of protein spots by ICP-MS. On peptide level ABI�s iTRAQ and label-free proteomics methods are offered as complementary proteomics approaches. Visitors today: 242 - total: 55010. *iTRAQ™ is a trademark of Applera Corporation or its subsidiaries.